It has been a while since I have had the opportunity to experiment with a new cake recipe since I have been busy baking pandan cake orders. It is fun to to make something different for a change. However, this is not a completely new recipe but one that can be found in my Low-Sugar Bakes and Cakes Book. The only thing I did differently was to use fresh sweet corn rather than canned corn. I wanted to see if fresh corn could be any better as I do prefer to avoid canned or preserved items. Steam the whole sweet corn for 25 minutes. Remove the corn kernels and slightly chop. Keep aside. 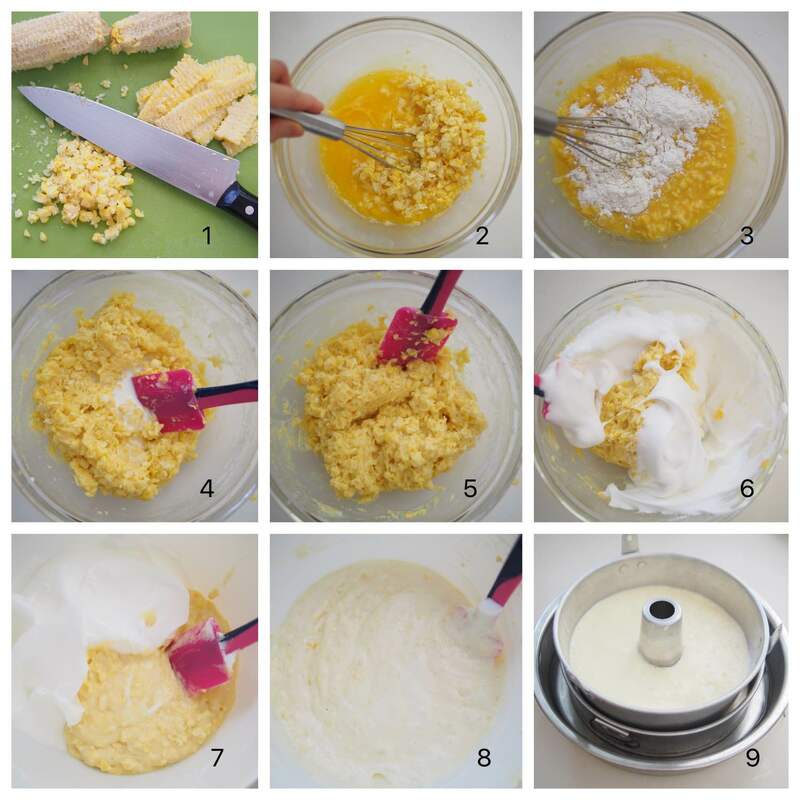 Using hand, whisk egg yolks, melted butter, fresh milk and sweet corn together until well combined. Sift in the flour, baking powder and salt, mix again until well incorporated. Set aside while you prepare the meringue. Using an electric mixer, whisk egg white and cream of tartar or lemon juice until foamy, then add caster sugar and beat until firm peaks formed on high speed. Firm peaks are between soft peaks and stiff peaks, the meringue is glossy and curl slightly at the tips when the whisk is lifted. Fold 1/3 of meringue into yolk batter with a hand whisk or spatula until combined. Add another 1/3 portion and fold gently. Then pour in balance of meringue and fold until just combined. Tap the mixing bowl lightly to remove air bubbles. Pour batter into the tube pan. Water bath - Place the cake tube pan into a pan slightly bigger before placing into another bigger pan filled with hot water until ¼ full. Bake in water bath for 1 ½ hours or 90 minutes at 160°C. If you see the cake start to crack, reduce the temperature to 140 - 150C. Remove water bath at the last 10 minutes so that the sides of the cake will not be too wet. If the sides of cake still wet, leave the cake inside with oven off and door closed for 10 minutes. Immediately invert the cake to cool after removing from oven. Unmold the cake after 30 minutes or when is cool enough to handle. The temperature and time durations are just as a guide. Please adjust according to your oven. I found that I added too much sweet corn and it made the cake slightly dense. However, it tasted very nice. I believe the cake will be lighter and rise slightly better with less sweet corn. 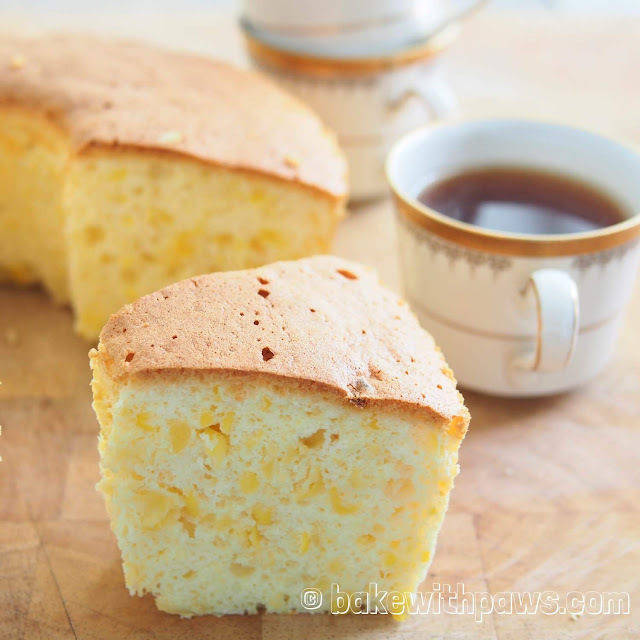 I am a big fan of sweet corn cake but has yet to find the right recipe for me. Tried 1 with corn kernel from can but taste too light. Tried another 1 with cream style sweet corn n feedback was Cake was too bland. I am happy to have found this recipe and will be trying it out soon. Do u think I should add more butter since amount of corn will be reduced by 1/3? Thank you for your comments and I hope you will like this cake too. 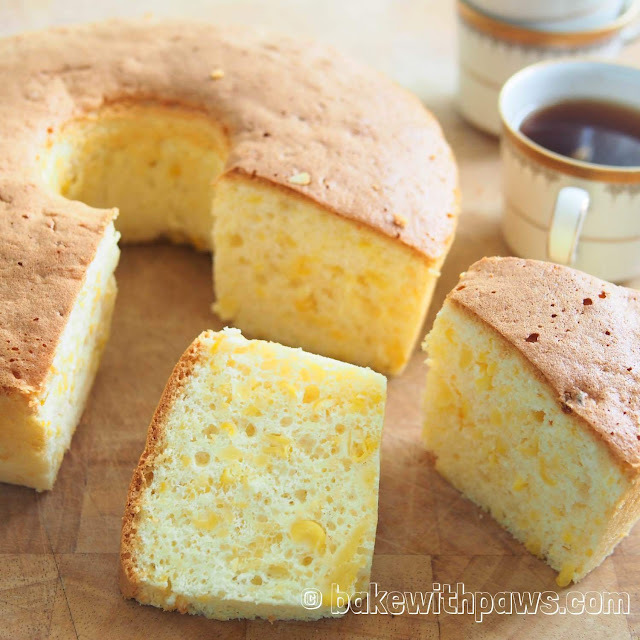 I would suggest keep the amount of butter as the recipe above as it may change the texture of the cake. You may keep the same amount of corn kernels (180g) if you prefer more sweet corn taste and don't mind the cake to be slightly dense.